At just 1290g, this is a lightweight lid, and the gloss finished, carbon-fibre shell makes it look much more expensive than its price tag (let alone the fact that some dealers have been advertising it for £300). 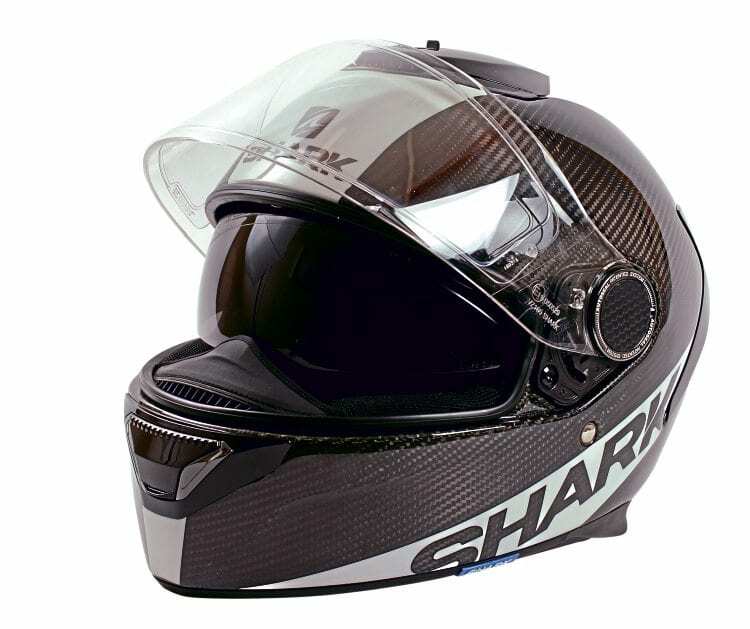 Available in several styles, the helmet comes with effective and easy to operate chin and top vents, a pair of exhaust vents, a moveable chin curtain, Max Vision Pinlock and a drop-down dark inner visor. The Spartan is a sporting design, so can feel slightly higher at the back compared to a touring lid, but it has superb visibility through the large anti-fog Pinlock insert. The washable, replaceable lining is wonderfully plush, though still reassuringly snug, particularly around the cheeks. At first, after half an hour of use I’d have a sharp pressure at the rear, but under the lining I found a removable strip of padding – taking this out cured it, making the Shark a much more comfortable place to be. The visor is very easy to remove with no tools or levers – simply pull it out. 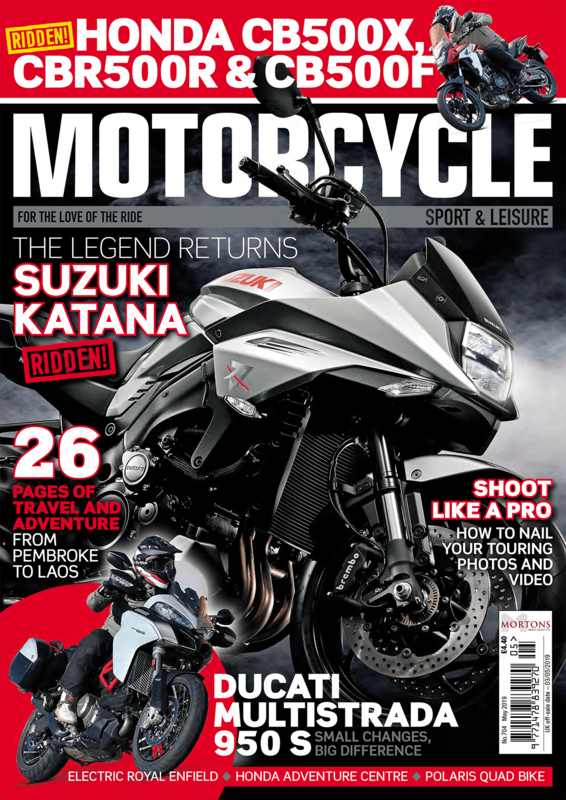 Cracking it open while riding for a little extra air can be a slight fiddle – the ideal position is to push the visor’s left-mounted handle’ to the right and slightly up, which creates a half-centimetre opening. Pushing straight up takes you to the first ratchet position, which is a good three centimetres wide. There’s no catch for the visor, but to seal it fully just requires it being flicked shut, rather than slowly and gently lowered – much the same as most ratchet visor mechanisms (and pushing down at the middle top gives the very best seal), though this one is particularly smooth, not giving your head that annoying shake as it’s opened. There’s plenty of room for my glasses, and even small indents for intercom speakers (or the Sharktooth integrated system that this lid’s prepared for). I prefer using a dark visor in bright sunlight, but the Shark’s inner visor is good, leaving only a small line of the bright light I find distracting at the bottom – probably one of the best I’ve used. It’s deployed using a sliding button at the top of the lid, which is fine. The Spartan certainly looks aerodynamic with its sleek design and raised rear fins. The chin curtain can be pulled out while riding, and while in an upright riding position it can catch on the collar of bulky jackets, it’s an effective system. There’s also a ‘Shark Skin’ cover to the two side pods, which is claimed to reduce whistling. Without peeling it off, I can’t say how effective it is, but on an unfaired bike the lid is quiet enough (though still needs earplugs). On a bike with a screen, I noticed little difference. 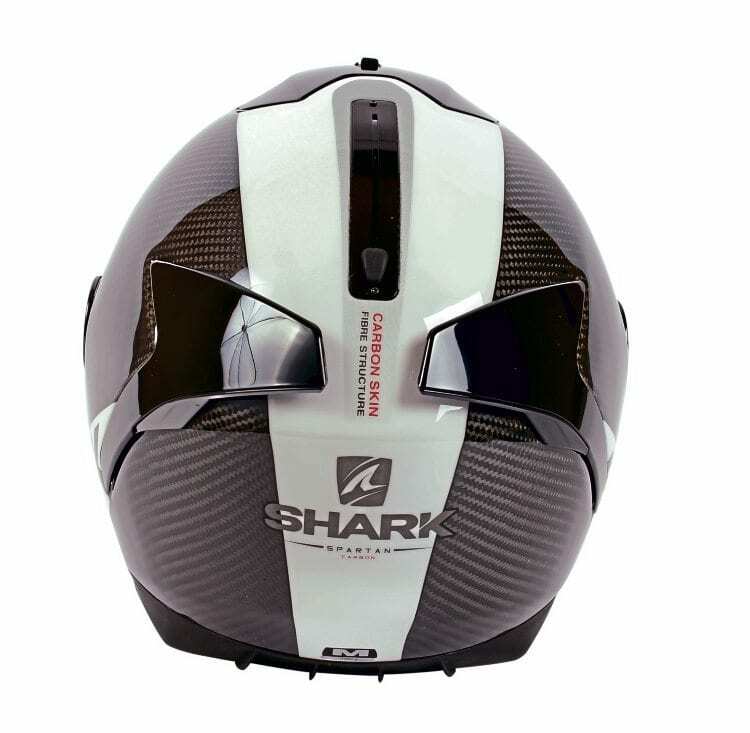 My first helmet developed a hairline crack in the white decal on the top – this in no way affected the structure of the lid, but it was still replaced with no fuss by Shark, which offers a five year warranty with all its lids. Well sealed at the rear of the neck, and fastening with a D-ring, the Spartan is a sharp design that offers a lot for the money.